I realize that I am straying off course here but I have my reasoning. Many people that will visit my BelgiumKing web site may not have an opportunity to visit this beautiful country. It is for these readers that I am listing places in the United States where either the feeling of Belgium exists or they have an excellent Belgian beer selection where one can try numerous Belgian beers. My whole purpose of creating this site is to educate and enhance people’s appreciation for Belgium and especially Belgian beer. While I still feel that if it weren’t for Monk’s, I never would have had the pleasure of enjoying Belgium and Belgium beer, Kickback’s in Jacksonville has become the new ‘Mecca’ for beer lovers in general and Belgium beer lovers specifically. Owner Steve and his partner Ed have taken their original, already fantastic, gastropub and multi-tap establishment and added on to is and created a monster of an excellent ‘beer heaven.’ There are over 1000 different bottles available including some rare aged examples along with 204 tap handles. (No…this is NOT a typo! !_ 204 different tap handles. They specialize in all types of food including comfort foods like PB&J and Mac ‘N Cheese all the way to excellent Belgian cuisine. The Belgium basement will take your breathe away. This should be on every beer lover’s bucket list! Owner Tom Peters got the Belgium bug long before most in the U.S. even knew what Belgian beer was. Tom and co-owner Fergus Carey opened Monk’s in 1997 and in my opinion; this is the best Belgium Café in the U.S. Tom travels to Belgium often and is always seeking new beers to offer the discerning customer. Monk’s was the first café in the U.S. to offer Chimay on tap and is usually the first to offer new Belgian beers as they become available in the U.S. market. There is a full menu and Monk’s prides itself by offering traditional Belgium meals. I also find it interesting that on many of my trips to Belgium, Tom and I cross paths often in Belgium. Owner Chris Lively opened Ebenezer’s in 2004 with a few Belgian tap handles and an assortment of bottles. 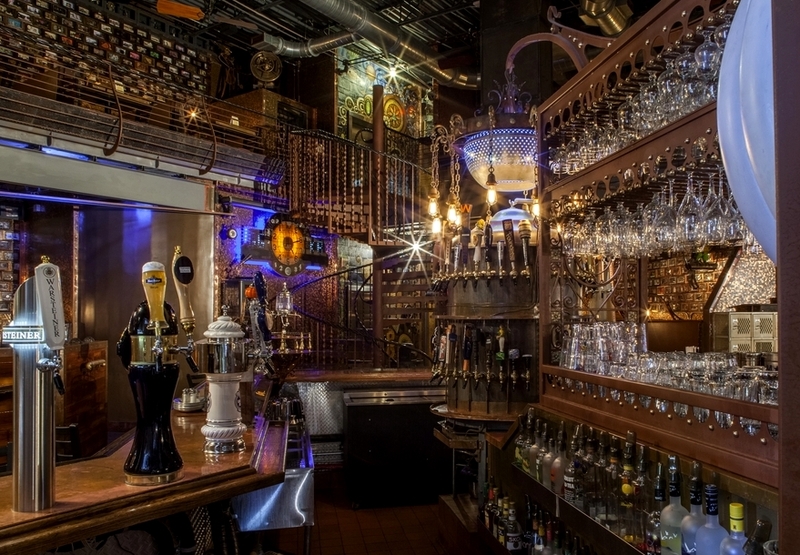 Today, they have 35 tap handles and over 500 different bottled beers. A visit in summer 2012 proved that this is an excellent destination for any Belgium beer lover. The tap list had numerous rare beers and the bottle list was al so very unique with numerous vintage bottles. There were some Belgian classics on the menu. This is a world-class destination for beer lovers and I know that Chris has the same penchant for cellar aging beers like I do. It is a 90 minute drive from Portland but well worth the trip. If you need lodging info in the area, shoot me an e-mail and I’ll give you some options. Brick Store is a beer and wine bar and restaurant right next to the old courthouse in downtown Decatur. They open for lunch and dinner but during the day, only the main bar downstairs is open. After five is when you want to arrive. This is when the Belgium portion of the bar opens upstairs. Not only does Brick Store have a Belgian feel to it, if you don’t feel it at first, they have over 150 different Belgium beers to help transport you quickly. I’ve been here a number of times and they always have at least one or two new beers that I haven’t tried, so they get a ‘2 thumbs up’ for this. The only downside is that they tend to play some New Age, Goth and Trance music here and sometimes a bit too loud, very unlike Belgium. But with the selection, I can overlook this one transgression. If you visit Chicago this is a must. I will admit that there are 2-3 other great Belgian inspired beer bars in Chicago, but this is my favorite. Not so much for the Belgium feel as for the diverse selection of Belgian beers. They always have some great Lambic or Gueuze or some other extraordi nary beer on tap (sometimes many, many) as well as over 100 great bottles. The service is immediate and the servers are knowledgeable and Map Room has a great atmosphere. If you are doing a pub-crawl, make sure you put Hop Leaf and Delilah’s on the list. In fact if you are going to Chicago, e-mail me and I’ll send you my pub crawl ‘list’. 26 tap ha ndles, 2 beer engines and over 100 different bottles, owner Brent Hernandez goes out of his way to find one-off kegs of exciting Belgian and Belgian style beers and a visitor will never be disappointed here. As with most true Belgian bars, they strive to serve their beers in the matching glass. Red Light Red Light recently added the ‘sour bar’ where they will always have at least one sour beer on tap. Anothe r fantastic beer bar with about 60 taps and 100+ bottles, many of which are Belgian. Once again a knowledgeable staff and decent service once you make it to the bar. Lacking a bit on the Belgian atmosphere, but makes up for it with great beer. 6 tap handles, one cask and about 100 different bottles with the majority Belgium or Belgian style. Opening in 2003, most thought the owners crazy to try to make a go of a high-end Belgian style bar in an area of cheap beer bars; but those people were wrong. On any given night this place is packed with visitors from all over the area that have come to expect rare one of a kind beers on tap and sometimes even rarer bottles. A very traditional Belgium restaurant and bistro a stone throw from Greenwich Village. If a resident from Belgium is ever homesick in the Big Apple, they need to take a cab ride here and they will immediately feel at home. Lots of wood and mirrors; it reminds me a bit of a cross between Mort Subite and Chez Leon in Brussels. Good food and about 40 Belgian beers in bottles with about 6 on tap; but all are Belgian. If you go out the front door and cross the street, there is a tiny Belgian bistro there that has about 12 Belgian beers and some traditional Belgian fare as well. But for a real Belgium feel, the Markt is right on the mark. Great beer bar with around 50 drafts and over 100 bottles about a quarter of which are Belgian. The bar is very small as are many bars in Belgium and there really isn’t much of a Belgium feel, but they do have some great Belgian beers. 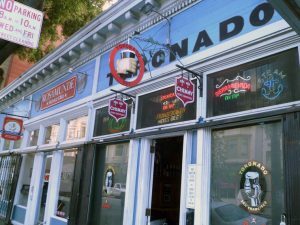 There is a second location in San Diego that is also a very cool place…not as much character as the original; but still an excellent place to enjoy a ‘taste of Belgium”. Honorable mention – Brickskeller, 1523 22nd Street NW, Washington D.C.
For years the Brickskeller was an institution in the United States having the largest beer selection and was listed in the Guinness Book of Records. Unfortunately the owners sold Brickskeller in December 2010 and it has re-opened as the Bier Baron; a 50 tap house with 500 bottles. Another multi-tap in D.C. is RFD, 810 7th Street NW, Washington D.C. They have 300 bottled beers and 30 taps. Many of the dishes on their menu are made with different beers. They usually have a good variety of Belgian beers to go with the great food here.